The most common and popular enzyme currently used in CRISPR is Cas9, which was the first genetic editing enzyme discovered. In recent years, scientific advances have found that a lesser-used protein, Cas12a, was found to be more effective and precise in gene-editing. This is because Cas9 is more likely to edit the wrong part of the genome causing it to disrupt the healthy function of the plant or animal. In human, this kind of mistake in the CRISPR system could be catastrophic. Graduate student, Isabel Strohkendl, and professor Rick Russell found that Cas12a is a more precise gene-editing scalpel than Cas9. 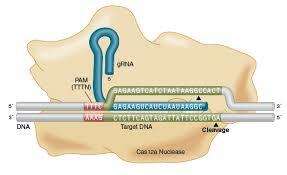 It is choosier because it binds like Velcro to the genomic target, whereas Cas9 binds to its target more like super glue. Cas9 focuses more on where to bind at the first seven or eight letters rather than paying attention as the process goes on. This means that it could easily overlook a mismatched pair that would lead to editing the wrong part of the genome. Whereas for Cas12a, the bonds are relatively weak making it much more likely to edit only the intended part of the genome. I believe that this is new information could one day provide an error-proof gene-editing tool. Although it’ll be a long time till gene-editing is safe enough for use in humans, this new information could open the door to various possibilities.